Pain McShlonkey Classic Returns to Squaw! 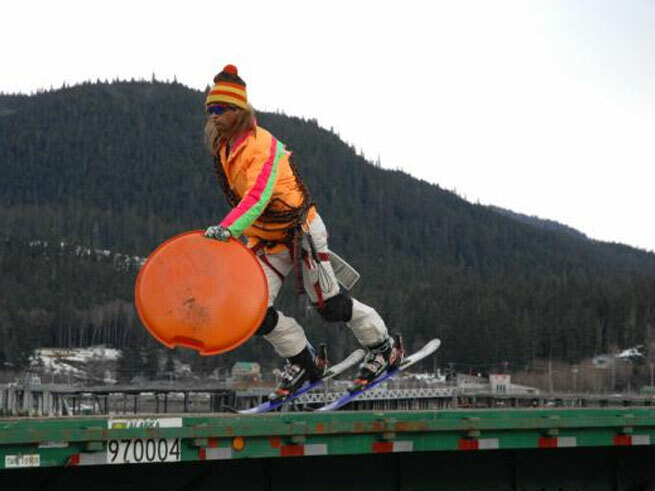 Shane McConkey's quirky alter ego, Pain McShlonkey. As an on and off mountain event, the Pain McShlonkey Classic is a wacky part of Tahoe culture in which all proceeds from the weekend benefit Make-A-Wish Foundation, along with environmental education programs. The event was dubbed after one of Shane’s funny alter egos, Pain McShlonkey. Hosted on March 23-24th at Squaw Valley, the McShlonkey offers the world’s top winter atheletes a chance to compete for the podium on none other than snowblades! Saturday’s on-mountain antics promise true slope-side entertainment for all ages. The Red Bull Air Force will kick off the festivities on the afternoon of Friday, March 23 as athletes like Charles Bryan, JT Holmes and Tim Dutton skydive into The Village at Squaw Valley. Now that’s just the beginning. From there, the party rages on at Rocker@Squaw with a DJ, food and drink specials and poster signings with pro competitors. The real throw down begins Saturday, March 24 at 9 a.m. as the athletes line up atop the legendary KT-22 chairlift for an all-out snowblade banzai. The pros will take on 30 of McConkey’s biggest fans in an anything-goes battle to the finish on Squaw’s GS Bowl. It’s a sight to see, especially the costume choices you’ll see whiz by. To top off the weekend, don’t miss the 80’s after party at Squaw’s Olympic Village Lodge. Guests must be 21 or older to attend with valid ID required. To find out more, purchase tickets to the after party on March 24th ($25/each), or make a donation to the Shane McConkey Foundation, click here! 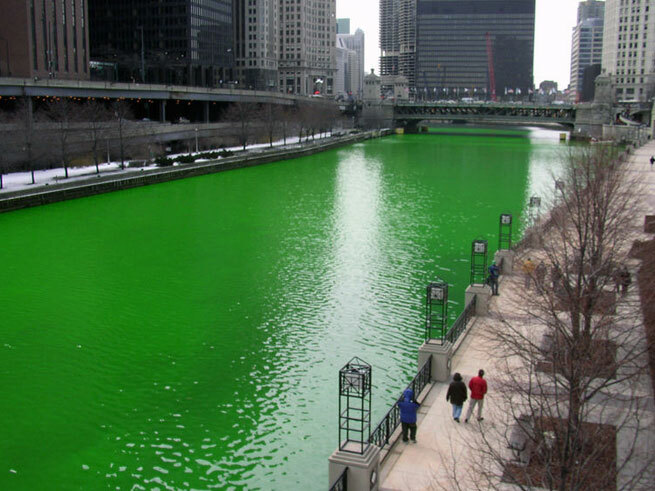 An American St. Patrick's Day tradition: Chicago River dyed green. In Ireland most natives pin on a sprig of green, attend morning mass, and drink a pint in the afternoon or feast with family at dinner in honor of St. Patrick’s Day. Until the 1970s, St. Patrick’s Day in Ireland was a minor religious holiday. But in the United States, rivers are dyed green, there are large parades to celebrate the Irish, and millions don green for the day. For Lake Tahoe locals and vacationers, we may have more than a sprig of green – more so a white and powdery day on the slopes! But why not capture the essence of the above Irish blessing, and grab some friends, enjoy the coming of spring, drink a pint, listen to some live tunes, dance a jig and find out how the Irish keep life so light and lively! There are all kinds of St. Patrick’s Day celebrations happening around Lake Tahoe on Saturday, March 17th. The question is how do you want to celebrate? We’ve included a few choices! Just remember to wear green, stay safe and tip your hat to St. Patrick! Celebrate the holiday at Squaw Valley with all of your favorite Irish traditions! Ski the green slopes, hang out at the KT Base Bar for our pig roast and listen to L.A.vation, The World’s Greatest Tribute to U2 while you enjoy festive beer from Guiness, Harp and Smithwick’s. From 3pm-5pm in the Village Events Plaza, The Blarney Band will perform traditional Irish music. Catch Lenny the Leprechaun on the slopes for a special treat from his pot of gold! Be sure to check out Auld Dubliner at Squaw if you want a taste of traditional Dublin on this Irish holiday! Celebrate St. Patrick’s Day at Alpine! Come dressed in your best St. Patrick’s Day costume for a chance to win a CamelBak full of swag! All costumes will be judged at the St. Patrick’s Day Après Ski Party taking place on the Sun Deck from 1pm to 4pm. Enjoy Irish food and drink specials and live music by the the Nibblers! The fun starts at Jake’s on the Lake with traditional Irish food all day (also serving lunch/café/dinner), Happy Hour Specials 4:30pm-6:30pm, Live Music: Mark Wilson at 6pm. The party continues at Hacienda del Lago (upstairs) with live funk “Terraplane” from 9:30pm-2am, and L.A. DJ Dre Tuna at Lakeside (next door) from 10pm-2am. Bounce around from bar to bar; Bushmills Girls, music and drink specials all night at all three venues! What’s your favorite way to spend St. Patrick’s Day? 2-Night Ski Giveaway: Sweet Skiing Sweepstakes! With the 56 degree weather, and bluebird days at Squaw Valley and Alpine Meadows, spring is definitely in the air. But don’t think we’re out of the snow woods just yet. (We know, we know. We haven’t been deep in them, but it’s only March!) We have another set of big storms on the horizon, which means more powder for your play! So don’t pack away your gear just yet. Especially if you want to come ski/ride Squaw and Alpine on us! We’re giving away a 2-night package at Squaw Valley Lodge, a Sweet Skiing Sweepstakes that’s sure to treat you right, both your powder legs and sweet tooth. There’s no trick or gimmick to winning. Simply ‘like’ our Facebook page, fill out a short entry form (60 seconds short!) and check back on March 19th to see if you’re the lucky winner. Be sure to share with all your family and friends! Because if you don’t win, hey – maybe your spouse or best friend will. And that could amount to a nice little spring sweep at Squaw for you! You have until March 16th at 11:59pm to enter! Who ever said urban and rural life couldn’t intersect seamlessly? You can enjoy Lake Tahoe’s breathtaking great outdoors, tucker yourself out on the slopes all day, and still get your fill of a city-center cultural favorite: ballet. There is a company of young dance students in the Lake Tahoe area who are devoted to bringing new life to the cultural fabric of the region. 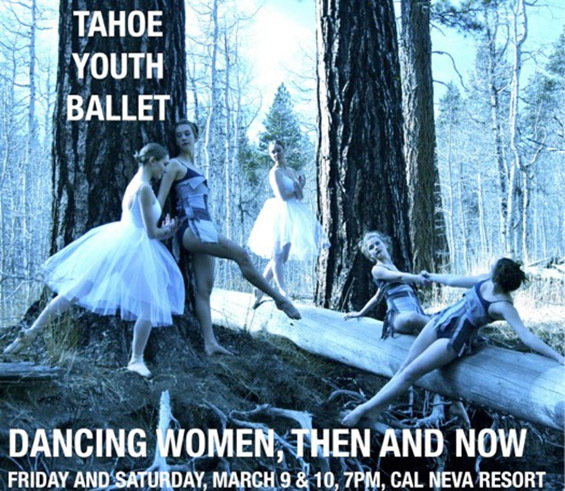 Tahoe Youth Ballet presents “Dancing Women, Then and Now” on March 9th and 10th at 7pm at Cal Neva Resort. “Dancing Women, Then and Now” features Act II of Giselle and the premiere of Into the Trees. The gala opening night tickets ($55) include admission with preferred seating, a semi-formal post-show party and two raffle tickets. General admission tickets are also available at both performances: Adults, $20; Students/Seniors $10. For more information about Tahoe Youth Ballet, performance dates, and a sneak peek of Into the Trees, click here. What do you think of seeing a professional level ballet performance in Tahoe? Bluebird days at Squaw Valley are unbeatable. It is practically impossible to utter the words ‘Lake Tahoe’ without mention of its world renowned alpine skiing/snowboarding, and epic winter snowfalls averaging 300-500 inches per year. The location and amenities of Lake Tahoe as a winter destination is truly unique and astounding. There’s an age old local saying at Tahoe, “You come for the winter, stay for the summer, and never leave.” And here’s (generally) why: The largest alpine lake in the US, a deep color of blue and emerald green, stretches 22 miles long, and is surrounded by 12 world class ski resorts and 12 premier golf courses. You don’t have to be a skier/snowboarder to fall in love with Tahoe winters. You can still make the most of winter/spring with all kinds of activities the whole family will love: ice-skating at High Camp, followed by a dip in the hot tubs; sledding or tubing at Tahoe Donner’s Sledding Hill; cross-country skiing at Royal Gorge; or snowshoeing through picturesque Squaw Valley. Or how about sitting back and allowing a furry friend to tug you along at your very first dog sled ride? The possibilities are endless when it comes to winter fun at Tahoe. Choose groomed trails, or blaze your own through powder. Powder's a major work out! Don't own snowshoes? You can rent them at Squaw Valley! This winter season has actually been unseasonably warm, in stark comparison to last winter’s epic snowfall of over 643 inches! 2010-2011 was the 4th snowiest winter ever on record for this region. There were high hopes the Truckee-Tahoe area would enjoy another tremendous winter season, but November through February felt more like autumn than anything! It gave many residents and vacationers the rare opportunity to enjoy summer-like hobbies, such as kayaking on Donner Lake in January, or taking the dogs out for a run on dry trails in February. Even so, many locals and vacationers alike still ached for the blustering winter days we knew and loved so well. Then, in Tahoe fashion the powder arrived in a flash! Last week, from Sunday night to Thursday evening Squaw Valley got dumped with a total of 57 inches of fresh snow. It was a blizzard of a week, but come Friday morning there wasn’t a cloud in the sky. A perfect bluebird day, with temperatures at a balmy 45 degrees. It’s perfectly blissful out there. 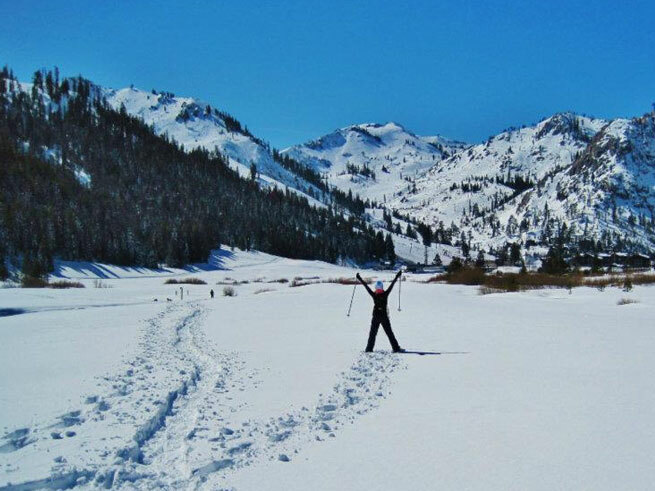 It’s tough to pass up skiing/riding in powder, but if you’re looking for a different kind of day at Squaw Valley, then grab your snowshoes and head out with the whole family for a hearty work out! 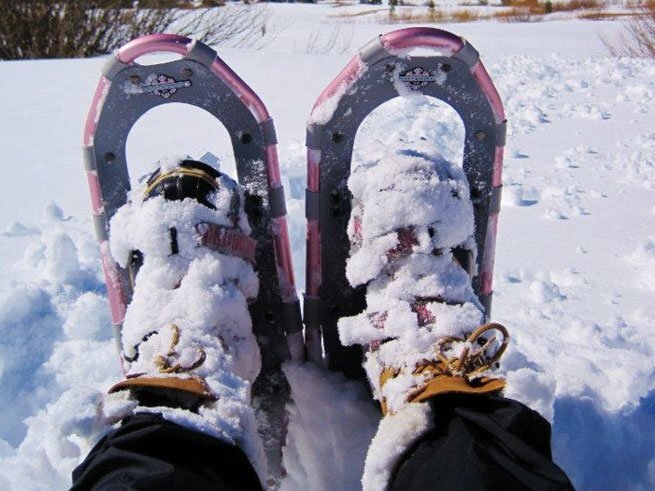 If you don’t own snowshoes, you can rent them at the Nordic Center located at the Resort at Squaw Creek. What do you think of snowshoeing?